Bahrain Bourse (BHB) and Almoayed Chambers signed on Tuesday 10th April 2018 an agreement to appoint Almoayed Chambers as an Authorized Sponsor on Bahrain Investment Market (BIM), an innovative equity market for growth companies in Bahrain and the wider MENA region. The agreement was signed by the Chief Executive Officer of Bahrain Bourse, Shaikh Khalifa bin Ebrahim Al Khalifa and the Chairman of Almoayed Chambers, Mr. Aymen Tawfeeq Almoayed. The Chairman of Almoayed Chambers, Mr. Aymen Tawfeeq Almoayed said, “The creation of the Bahrain Investment Market within the wholly self-regulated framework of Bahrain Bourse is a phenomenal achievement and exemplifies the positively disruptive and innovative vision and wisdom of Bahrain’s leadership. We are proud of the humble supportive role we played in its creation and look forward to opportunities to further aid the market and its members as Authorized Sponsors.”Almoayed Chambers is a professional services firm that invests in solving the problems and concerns of its patrons and their numerous commercial and social enterprises. We are completely focused on value creation, innovation and protection of our patron’s interests and only partner with patrons that share our values and have wholly aligned interests. Our chambers operate throughout a large spectrum of specializations and spheres and through partnerships and arrangements with select guilds around the globe. We serve our selected patrons from “cradle to the grave,” a reality which forces our reach beyond rigid jurisdictional and industrial borders. We are where our patrons need us to be and we do what needs to be done. 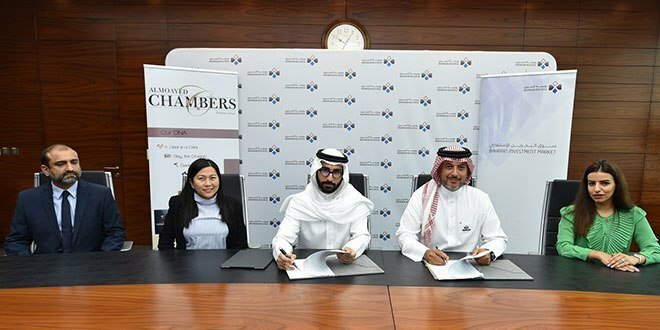 Bahrain Investment Market’s partnership with Almoayed Chambers follows similar tie-ups with well-known specialized advisory firms such as BDO Jawad Habib, Keypoint, KPMG, and SICO. As per BIM rules, companies must appoint and retain a sponsor both pre and post listing. In return, the sponsor is responsible for providing companies the required support and guidance to fulfill the BIM admission and financial disclosure requirements, and ensuring all pre-listing requirements and post-listing documentation and disclosures are continuously met. It is worth noting that Bahrain Bourse operationally launched the Bahrain Investment Market (BIM) in March 2017 to offer the region’s fast-growing companies an alternative cost-and time-effective means for raising capital. The BIM has been launched in strategic partnership with Tamkeen to support businesses and enterprises to cover their costs associated with listing and appointing a sponsor. The market features relaxed admission requirements and reduced financial disclosure rules, access to global investors, guidance services through authorized sponsors, a dedicated Tamkeen support program, and a number of other unique value-added benefits and features. Next articleThe Mercedes-Benz Mobile Service Truck is now in Bahrain!